Price comparison is important – don’t hesitate to call us at 970-665-2194 for information! While there are a number of resources out there (i.e., CMS’ Hospital Compare and Healthcare Blue Book), none compare to getting info straight from the source. 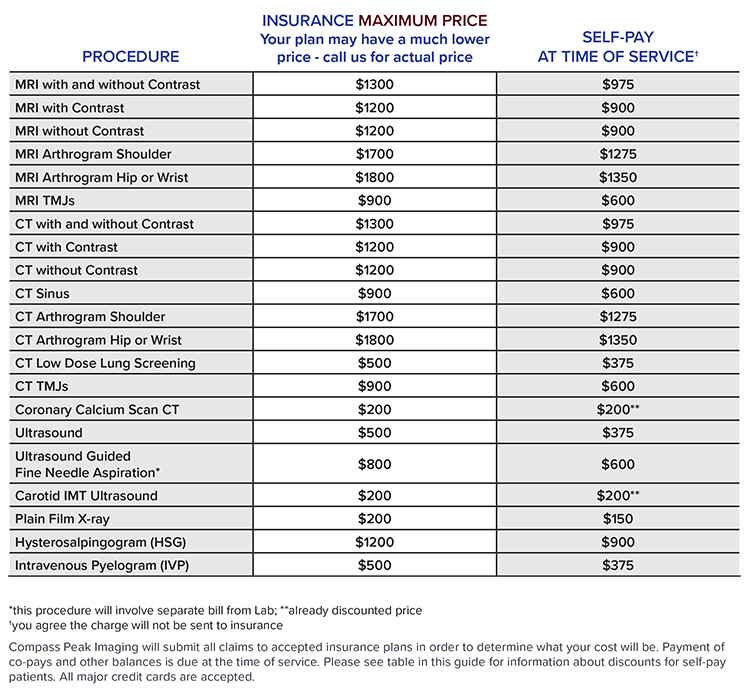 Always call your imaging center directly for pricing. Be sure to ask whether the price quoted to you is the entire bill. Most facilities have two fees: The professional fee (interpretation of your images) and the technical fee (cost of using the technology). Compass Peak Imaging will submit all claims to accepted insurance plans in order to determine what your cost will be. Payment of co-pays and other balances is due at the time of service. Please see table in this guide for information about discounts for self-pay patients. All major credit cards are accepted. We are continually adding coverage and this list is subject to change. If you have any questions about a specific insurance plan, please feel free to contact us.